Suppliers have been complaining for years that the two supermarket chains, which last year booked combined revenue of more than $70 billion from their Australian stores, were using market power to bully them over prices and supply. •discrimination in favour of homebrand products. PUB patron Janice, a lady with deep personal knowledge of dairy farming, agreed to write about the dairy industry as a case study of what happens when the big end of town decides to cream off the profits. Many thanks, Janice! Rule by thieves has always been part and parcel of life on the land. Scavengers and hangers-on abound in all types of farming. Consumers, who are in turn fleeced by processors and retailers, are blithely unaware of the pitifully low farm gate price and no doubt think the farmer is wallowing in riches. They can be excused for coming to this conclusion, given the prices they pay for farm products in the supermarkets. There was a time when dairy farms were small operations run by families who eked out a modest living on the land. They milked thirty to fifty cows twice a day, 365 days a year, ploughed and planted their fields to provide the necessary green feed and/or crops for year round milk production. Most dairy farmers also kept pigs to send to market to supplement the milk income. Pigs were fed the waste milk such as colostrum not required for the heifer calves being raised as herd replacements, and any fruit, vegetables or grain that would otherwise be wasted. In NSW these family farms were rigorously controlled by State Government Inspectors and their milk product tested daily for quality and the premises checked on a random basis for maintenance. In the 1970s, a quota system was functioning. Farmers purchased a quota of X amount of litres of milk for which they were paid a higher price than for “processing” milk which was whatever they produced above their quota, known as “surplus” milk. Farmers were penalised if, even under circumstances beyond their control, they did not meet their quota, or if, again because of circumstances beyond their control, their milk butter fat dropped below the stated quality levels. The penalty was harsh as it often meant the farmer’s milk was condemned and declared to be “surplus” quality for which he was paid less than half the price of his quota milk. Farmers were agitating for a rise of the farm gate price of their milk. Their costs of production were rising but the government declared that as milk was a staple food, consumers could not be asked to pay more. What wasn’t said was that it wasn’t in the government’s re-election interests. The Dairy Farmer’s Association continued with robust lobbying and finally demanded the government set out their reasons in writing for not granting the farmers a price rise for their product. When the reasons were finally given, the whole dairy industry was gobsmacked. Despite detailed submissions of individual farmers’ incomes and details of the production costs, all the DFA got was “NO”. Now the DFA had, in writing, the “costings” the government were basing their refusals upon. The dairy farmer’s wife was listed as a “cost” for the princely sum of $1 per day, and all hell broke loose. Who the hell would milk cows twice a day, raise the calves, share the ploughing/planting and other farm chores, for a dollar? – not this bluddy woman, they cried. Well, the government rolled over and the farmers got their price rise – 1c per litre. But that 1c per litre was spread over the whole industry, i.e. processors, vendors and the milkman. The farmer ended up with 0.1c but it was the start of fairly regular price rises and things were looking up for the poor old dairy farmer as he struggled to make ends meet. Then it all went pear-shaped as rumbles of deregulation began to sound all over the country. 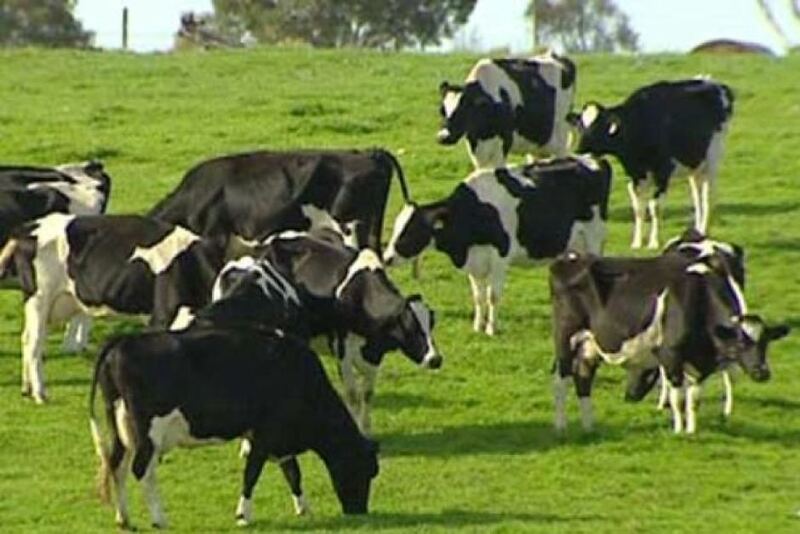 Victorian dairy farmers supplied the export market and the bottom fell out of it. Victorian farmers were seasonal milkers – they dried off their herds at the end of summer and resumed their operations in spring. Most of the farmers in Victoria were “owned” by Coles, as it owned the processing plants that paid the farmers. They were desperately seeking a new market and I suppose it was inevitable that Coles would cast their eyes across the border and send their milk into NSW. Naturally, NSW farmers and their Association objected to such an intrusion, especially as the volume of Victorian milk coming in threatened the stability of NSW price structures which covered the higher production costs in the winter months. The dispute quickly became out-and-out war. Farmers rallied and protested outside Coles supermarkets or any shop which stocked Victorian milk. The farmers won the first battle but lost the war when Coles went to court on the Constitutional ground that state borders cannot be closed to trade between states. While all the court argy bargy was going on, Coles were busy buying out dairy farmers co-operatives which owned the processing factories. Farmers countered this by co-operative mergers to enable them to compete. It worked for a couple of years but the smell of deregulation was still in the air. to the acknowledgement that prices needed to fall. Farmers received $1.73 billion for restructuring and as a result of deregulation the number of dairy farms has fallen from 12,500 to 7,500. Since deregulation the prices that farmers receive are governed by the free market. It is apparent that when looking at the dairy industry at a national level, most dairy farmers will not be significantly worse off because of the price cuts. This is because the vast majority of milk production occurs in states such as Victoria where a number of processors operate and drinking milk represents a relatively small share of production, compared to the production of manufactured dairy goods. Due to significant export opportunities, international prices are a key determinant of the income farmers in those areas receive. However, it is clear that in states which do not have these characteristics, such as Queensland and Western Australia, the impact is potentially greater. In these states, there are few processors operating and milk production is primarily for drinking milk. The emphasis on drinking milk means any pressure on retail prices could potentially be pushed back down the chain, although at this stage there is no evidence the major supermarkets have done this. Additionally, in some areas it is also difficult to distinguish between the consequences of natural disasters, such as the Queensland floods, and the impacts of the discounting. One key area of concern for the committee, however, was the speed and ease with which a certain group of farmers in Queensland contracted to Parmalat were affected by the cuts in the retail price of private label milk led by Coles. Under these arrangements, it appears the risk of any retail price movements or other shocks that affect the sales of branded products are in large part being passed immediately onto the farmers. It is not clear why this should be the case when the processor has chosen to supply both products to the supermarket. Whether a consumer chooses to buy a bottle of processor-brand milk or the supermarkets’ private label should not (again, as a matter of principle) be a concern for farmers. Although processors are undoubtedly in a challenging position, the management of their branded products and the terms on which they supply private label milk to the supermarkets is a matter for them. That the Federal Government extend the Australian Consumer Law framework dealing with unfair contract terms to business to business agreements involving small businesses and farmers. The Government introduced laws dealing with unfair contract terms which took effect at the Commonwealth level on 1 July 2010 and have been in place in the laws of all jurisdictions from 1 January 2011, as part of the Australian Consumer Law. The Government notes that these provisions have only been in place for a short period of time and that, should extension of the provisions be considered in the future, careful consideration would need to be given to the costs and benefits of doing so. It will be interesting to see whether the revisions to unfair contract terms are of assistance to the ACCC in its current investigations. ← THE “HOW TO” STICKY: USEFUL HTML + ADDING MEDIA TO COMMENTS AT THE PUB. Whoever is talking in the Senate is on a protracted whinge. She seems to be very upset that the PM is visiting Western Sydney. I think that was Fiona Nash that was gnashing her teeth. “I’m comforted by the fact that they obviously see this as serious, but I’m troubled by the fact that they’ve suspended their investigation. “A three-month delay is quite significant. Mr Perrett says he will be writing back to the AFP, arguing that parts of the investigation could continue despite the appeal because Mr Brough is not party to the ongoing legal action. did i link this excellent article on taxes? However, what interests me in these articles is information that gives me a fresh perspective on the themes that run through Australian commentary about our economy. Some of it that I found contrary to what I believed to be the case, and not in the positive way that I had presumed for the federal government. Although, I must add, it can be explained if one takes the time to sort through the data available. Might I also add that Canada, run by a Conservative government, has an economy in a worse predicament than ours. I’m not entirely sure, but is it the case that Bond Yields on Debt are poor if a country is likely to return to Surplus? Australian government bonds are poised to snap four months of losses as Italy’s election deadlock revives demand for the highest-yielding top-rated sovereign debt.
. Among the eight top-rated sovereign markets that also have “stable” outlooks from the biggest credit assessors, Australia is the largest borrower after Canada with A$263 billion ($270 billion) of debt outstanding. Could it be because of this? The Aussie’s strength has been a drag on growth. From a September 2011 peak to the end of 2012, there has been a 17 percent decline in the terms of trade, or the windfall that Australia gets from its exports, the central bank estimated this month. The statistics bureau said today business investment declined 1.2 percent in the three months ended December from the previous quarter, contrasting with economist forecasts for a 1 percent gain. Other data released in February showed an unexpected slide in retail sales, a third monthly drop in full- time employment and the biggest decline in 10 months in home- loan approvals.